As new estimates show the Gulf oil spill to be the biggest in U.S. history, and images of birds and sea turtles covered in oil begin to surface, the call to end offshore drilling in this country is growing. While images of oiled wildlife and beaches hit us in the gut - and are part of the reason I got involved in ocean conservation decades ago - there's another reason why it's time to stop drilling for oil in our oceans. It might not have a face or feathers, but it's just as important. The reason is this: The stubborn push to continue drilling not only fouls our oceans and contributes to climate change, it weakens our ability to join the emerging market for clean energy - specifically offshore wind. There are several hundred offshore wind turbines installed in Europe, and even China has begun building offshore wind. In comparison, the U.S. is embarrassingly far behind when it comes to utilizing our ocean breezes. Fortunately, several offshore wind projects cleared some major hurdles this year, and it's possible that we have our country's first wind turbines off the coast of Delaware and New Jersey in the next few years. One bad accident is enough. How does President Obama get away with giving money to all these countries and our Gulf Coast is broke? So many people without jobs and no recourse insight. Help Them. Why not take all the milliions that are spent on Political campaigns and help the people in this country that have lost their jobs because of Govt. take over. We should have elections like England. It last for only a few weeks and then election. NOt all the waste of money and boring ads. BP has made its mistakes but at that depth there is not much we can do but let Presdent Obama's experts run around chirping at each other.He could fly somewhere and give a speech, play golf, have a party, play basketball, point his finger and his five ways to solve the problem and best of all HE could grow-up and put his head on and see the real world. Bring our Troops Home. This is not our war and stop poking our noses in everyone business. Other countries don't do this. Support the Boarder Control and stop playing footise with Mexico. England made a good point this morning that part of their becoming a citizen is to speak ENGLISH. OF Course ACLU had to rear their heads. iI AGREE WE CAN NOT DRILL OUR WAY OUT ,SO IF ALL OF THESE ACTIVISTS WILL STOP RIDING AROUND IN LIMOS AND FLYING IN PRIVATE JETS BURNING UP SO MUCH FUEL ,I SAY THE FUEL USED EVERDAY WOULD GO WAY DOWN.I LIVE IN ALABAMA AND WHAT HAS HAPPENED TO THE BEACH I VISIT EVERY YEAR IS A SIN. Gosh, what a brave and thought provoking quote, 'We cannot drill our way to energy independence'. Yes, if the Republican-Tea Potty wing-nuts had their way they would try and fail to secure the millions of barrels of Oil that America exports from Saudi Oil terminals everyday. And many of the pre-existing major Oil fields have PEAKED and now are declining in production. SO Big Oil is going to make even more BILLIONS of dollars than they already have these past two years as Oil becomes more scarce, the cost inherently is going to climb ever higher! A keen observer the other day made the down to earth observation on a large but typical Coal Mine Open Pit used to mine and power a toxic gas spewing Coal fired electrical power plant. 'IF that Open Pit were covered with Solar Panels, those Solar Panels would produce as much electrical power as that of the Coal fired power plant WITHOUT the poisonous toxic pollution! Offshore megawatt wind powered generators should be accepted and applauded by the American public as well as environmentalists for acceptable large scale energy production. The new generations of giant wind generators turn their blades so slowly they shouldn't interfere with bird migrations making for one less 'objection'. It was refreshing to see Wolf Blitzer visit and comment on a 40 year old diesel spill in a marsh area and have the viewers see how much that original spill still exists in the soil, poisoning the aquatic life and all that feeds on those creatures. Over many decades Big Oil, News Media and News Announcers have carefully crafted the illusion that Crude Oil is not toxic, poisonous and carcinogenic. 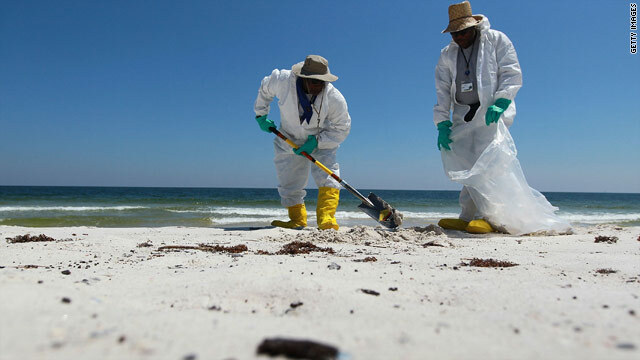 Many Americans prior to this enormous Gulf of Mexico crude Oil spill 'thought' if you cleaned up the oil on the surface of the water or ocean everything was just fine and dandy! Now more Americans are realizing that cleaning up the oil on the water and ocean's surface is just a tiny part of the toxic pollution. The major portion that sinks like asphalt to the bottom of the stream, marsh, ocean seafloor remains there killing aquatic life for many additional decades. Thanks entirely to Wolf Blitzer, more CNN viewers are now aware of that. Thanks-CNN. For decades Republican Louisiana politicians have sold their souls, lives and their States best interest to Big Oil special interests. They banked their future directly on Black Gold, crude Oil in the coastal region of Louisiana. Republican Governor Bobby (Captain Drill) Jindal is complaining out of the side of his mouth about the mess Louisiana is now in because of decades of Republican Louisiana politicians deregulating Big Oil leases and drilling projects from even the basic safety and environmental concerns. And out of the other corner of Republican Louisiana Governor Bobby (Captain Drill) Jindal's mouth he is yelling to stop the freeze on all Louisiana deep ocean Oil drilling. Bobby Jindal's completely reckless disregard for Big Oil regulations regarding basic safety and environmental impacts has resulted in the likely bankruptcy of many parishes across Louisiana and Bobby Jindal is yelling to drill some more spills at this time? You are a hypocrite! You bet the future of the people of Louisiana and you LOST. Your blame on the White House is entirely without merit, some blame may lie with your friends in BP, TransOcean and Halliburton who have likely given Bobby (Captain Drill) Jindal a great deal of money over his entire life in public service. But the real blame is the selling of Louisiana's future on poisonous, toxic crude Oil. People like James Carville and Ted Danson must be exaggerating. If Borak Obama thought that the situation in the Gulf was serious, he would have appointed a czar by now. It's like in just a few months past a year with Borak Obama into office, who would have ever thought that the great red, white and blue be crying and whinnying for a czar. Borak Obama or not.. No czar for you gulf people! ...And Ted Danson's credentials as an expert on oil & energy are??? Our country is not in a position to stop drilling we are too dependent on oil and too many Americans will have to change their ways. I want to know why is it they let so many other countries drill off of our coast? It seems to me that BP doesn't want to stop, or plug, the flow of oil,($$$$$), so they are 'dicking around' with trying to capture as much of the $$$, I mean oil, as they can. JUST STOP THE FLOW ALREADY!!!!! I believe they could have stopped it a long time ago, but they are trying to find a way to stop the leak & keep the oil flowing. Truely sad. Need to be looking at alternative sources of energy. The use of oil in cars etc., has probably contributed largely to the global warming and pollution of our air and environment. Need cleaner burning fuel. I work in oil, and I think the US goverment would do better to offer some help to BP instead of just biching about it. I´m no great fan of BP´s because they just screw there contracors into the ground, However I do think that they are trying there best and I don´t hear any good posotive suggestions coming from the US goverment. Has anyone noticed BP is not worried about capping the Well to stop the leak but only to Capture the Oil that is gushing out into the Ocean into tanker ships above the rupture. This is the classic case of the "Blind – BP leading the Blind – American Public and American Government" We need to demand that BP Shuts the well down now forget about reclaiming the oil when marine wide life and the lives of millions of people are at stake The whole world is laughing at this like it’s some joke. BP needs to stop polluting the environment now and worry about harvesting oil later. I agree some regulations may be too lax and watchdog agencies worthless. I feel disappointed some powerful companies don't have the self pride to run a really tight ship. I don't understand the present lack of deep sea capability when Piccard's Trieste went 35,000 feet to the bottom of the Marianas Trench in 1960. But I do know this. "Hot Taps" were performed routinely to connect additional sub sea feeders to live oil pipelines in the Gulf during the oil shortage of the early seventies. I sent an e-mail to the horizon solution website that included a basic drawing of a modified version that would kill and re-direct the flow to a surface vessel but also suggested they try to operate the Blow Out Preventer locally. That was three or four days ago. When I discovered they had tried to operate the BOP and also saw the video showing only mere inches of riser stub available to work with (a "Hot Tap" would need three to five feet) I came up with a solution using a "Clamshell" trunk. Since the riser stub has a saucer shaped flange still attached one can size the hole in the bottom of the trunk to the riser diameter. When the open "clamshell" which has been set beside the flowing riser pipe is shut and clamped it will mate with the pipe below the flange and not go anywhere without tearing off the end of the riser pipe. At this time the top of the "clamshell" trunk will be open and not impeding oil flow. When the cap is engaged at the top of the trunk to cut off the oil, no undue pressure to the "clamshell" trunk device will be felt since a forked pipe on its side will provide an exit. Sections of flex hose or piping will have already been attached to the exit pipe and added while the device was lowered. The exit pipe will enable a pressure relief and a means to conduct the oil to a surface vessel. I also took into account that the ROV's or remote operated vehicles would have a tough time shutting and locking the "clamshell" in place even though oil flow wouldn't hinder that operation. Therefore I included in the drawing a small self contained hydraulic system with actuators that would shut and lock the "clamshell" then shut the cap cover by itself. I learned basic hydraulics aboard submarines. I also trained in commercial diving and understand the difficulties remote operated vehicles might have trying to perform various operations. I want to help. We need to build a mock up pipe and flange, test the device, then get this in control! BP is doing a great job in the Gulf of Mexico. They are working with the local government and federal government too. President Obama will meet with the BP COE next week and they will find away to repair this problem. I have invented a solution-formula-methodlogy that i've been granted a Patent & trademark on for over 12 years now! I've been in correspondence's with Washington D.C. & E.P.A. to date nothing has been seriously done! I met with Senator Harry Reid over three weeks ago here in Henderson Nevada and we discussed this matter in person about the oil spill in the Gulf. Senator Reid put my in touch Michael Barton of the E.P.A. I've been in touch Senator Reids offfice, but haven't received any message from the E.P.A. on this most critical matter! In my correspondence I've explained how my Patented & Trademarked formula Terra-Kleen can be used safely to stop, clean up, and contain, the crude oil from spreading anymore in the ocean and how to clean up the beaches safely, without endangering their own health while doing it; as well as the Marine Life, Marshes, and Wet Lands. I have to date the only true Green Biodegradable formula that can do the job right and safely and I can prove it as it has been documented and approved for this years ago! I started doing this long before they started to campaign against products that aren't Green...I was responsible for pioneering the Earth Friendly, Biodegradable, Safe-Green products over twenty years ago! About the only ears I had to receive the message were my own at that time! Terra-Kleen has not only been tested and approved but, documented as well...by the U.S. Government, Mil-Spec for the military, U.S.D.A.-N.S.F., in Japan and others! Hitting on BP hurts far more people than the company itself. It is high time that we all realise that BP did not cause the failure of the rig. The real cause lies in our thirst for energy particularly hydrocarbons! To blame BP and to destroy their share price does not help one bit. What we, the public, need to do is BUY, BUY, BUY their shares as this will help the quest for cleaning up this ecological disaster! If BP goes under the tax payer will pay anyway so lets all buy the share and at least we will have a stake in the clean up. concerning the oil spill in the gulf, if ordinary citizens are given a chance to help resolve the problem. I might be able to offer my advice on the best method to tackle the problem. please feel free to contact me. this is a serious problem that has got a lot of people concerned and we should all be able to help look for a way of resolving it. Lady Gaga's new video – ALEJANDRO!